Finally greatful to join the belt talk forum. I’ve been a massive fan of championship belts for years ever since I saw the Winged Eagle back in 1990 and the Reggie IC. Started my collection with Smoking Skull and Winged Eagle replicas from WWE Shop but also a big fan of NWA/WCW titles. One area of interest for me personally is where the actual used screen belts ended up, especially the WWE ones so If anyone knows then please post or if there is a link to another thread on belttalk then please share. My knowledge extends to the Big Green was thrown into the trash can and the SNME/WM4 Winged Eagle was destoryed by Mr Perfect on the Brother Love show and sold to a private collector. Thanks and great to join. Hogan gave the Big Green to Linda's mother. The trash story is kayfabe. Hogan has the Rocky 3 belt, but had it releathered because the original strap was stiff and broken. He gave the Big Green to Linda's mother and I was told he recently tried to get it back. He has the Hogan 84. He does not have the 85. Not sure where that is. He has both ring used Hogan 86 belts. The Big Gold he has is the AFX cast which should have Jeff Jarrett's name on the back. For years he thought it was the original Crumrine, but it's not. Read the Big Gold book for all the details. What about the belts from the 90’s? Thinking Winged Eagle, Smoking Skull, Big Eagle and Oval IC. Remember listening to a Steve Austin podcast where Vince gave him the Reggie IC when it was retired because of the neck injury at Summerslam against Owen Hart. Also what happened to Warriors Blue/White/Lavender Winged Eagle and his/Michaels Blue/White/Yellow Regggie IC belts? Austin has the last ring used Reggie IC, but a bunch of them were used in the 10 years the design was around. Warrior sold most of his belts privately before he died. He quoted me $28,000 for the white Winged Eagle around 2003-2004. I did not buy it. There are numerous winged eagle belts. WWE has 1 smoking skull. Austin had the other but an ex girlfriend stole it. He had Millican make a replacement. Amazing knowledge. Thanks for the info Dan. I thick Rock had one of his old Big Eagles (his daughter tweeted about it someone was saying). Austin had a silver Smoking Skull made as well which i think he said was in his vault. I am sure a blue strap block logo big eagle was given to Arnie on an episode of Smackdown. What happened to the final winged eagle with the broken sidebar that austin won at WM14? Does he still have that? 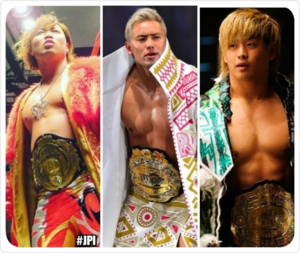 Also what info do you know about the Tag Belts? The classic ones from the Bulldogs in the 80’s until they were retired with the brand split. Off topic question. If I wanted to get a replica WWE Winged Eagle releather on proper leather then do you know anyone in the UK who does this? Rock has a ring used Big Eagle and was gifted the last ring used Spinner by the private collector who ended up with it. J-Mar made WWE a gold and a chrome smoking skull. WWE ring used the gold one and Steve kept the chrome one. That is the stolen one. There was only 1 ring used blue big eagle. It is privately owned. Arnold was gifted a belt, not THE ring used belt. Are the various Undisputeds known, too? I'm not playing "list the location of every ring used belt" though. Does anyone know who can releather belts in the UK? Great info Dan. If anyone has a link to the thread which shows what belts they have displayed at Axxess theb please share. Re: Undisputed - I think Brock Lesner kept the original V2. I think anyway. Not 100% sure. Interesting to find out where V1 went. Did Warrior ever use a Yellow Winged Eagle on TV or is that a myth? There were 2 v1's. A wrestler has one. A collector has the other.